Be the first to share your favorite memory, photo or story of Ana Paula. This memorial page is dedicated for family, friends and future generations to celebrate the life of their loved one. A beautiful light has been extinguished. 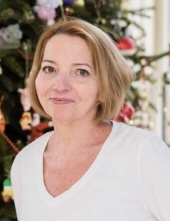 Ana Paula Sá of Newark, NJ, age 61, passed peacefully, surrounded by her loved ones on March 28, 2019, after losing her brave 4 1/2 year battle with cancer. Left to honor Paula and always remember her love and laughter are her husband, Antonio Sá, children, Mark Sá and Nicole Sá-Martins, son-in-law Junio Martins, brother Paul Soares, and grandchildren, Maximilian Sá, Valentina Martins, Cristiano Martins, and Alexander Martins, along with numerous nieces, nephews, and friends. Paula touched the lives of an incredible number of people and was a deep inspiration to all who knew her. Compassion and warmth were natural to her, which made her so excellent in her 20+ year career as a medical assistant, always nurturing others. The Memorial Service for Ana will be on Wednesday, April 3, 2019 from-6 - 8 pm at the Buyus Funeral Home 426 Lafayette St.at Wilson Ave., Newark, NJ 07105. Relatives and friends are welcome to attend. To send flowers or a remembrance gift to the family of Ana Paula Soares Sa, please visit our Tribute Store. "Email Address" would like to share the life celebration of Ana Paula Soares Sa. Click on the "link" to go to share a favorite memory or leave a condolence message for the family.